Win a Peroni Nastro Azzurro Gluten Free hamper! Peroni Nastro Azzurro’s Italian brew masters have perfected a new gluten-free recipe for Italy’s most iconic beer — without compromising on taste. Peroni Nastro Azzurro Gluten Free has the same crisp and refreshing taste with a notable citrus aroma as Peroni Nastro Azzurro. The gluten-free beer uses exactly the same ingredients as the regular Peroni Nastro Azzurro, including barley. However, a specific enzyme is added at the end of the brewing process that removes the gluten, ensuring Peroni Nastro Azzurro Gluten Free can be enjoyed by coeliacs or those choosing to lead a gluten-free lifestyle. Peroni Nastro Azzurro Gluten Free 330ml x 4-Pack is available now in Dunnes Stores, SuperValu and O’Briens Off Licences, and 330ml single bottles are available in many of Ireland’s best bars and restaurants. 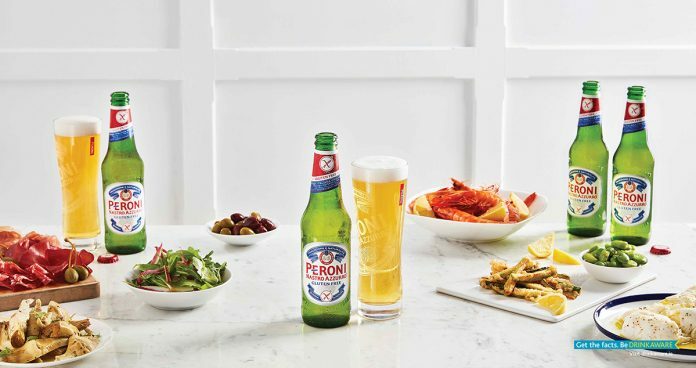 Peroni Nastro Azzurro Gluten Free would like to offer three readers the chance to win a Peroni Nastro Azzurro Gluten Free hamper! To enter, fill in the form below. Terms and conditions apply. Next articleWin a Judge table top grill!